I Got A Guy for That! Home » Blog » I Got A Guy for That! We all know someone that knows something (or thinks they know something that can help you out). But, you want to beware and not cut corners especially when it comes to backyard safety. We encourage all pool owners to hire a pool company at least for their first year to maintain their pool. There are a lot of things in the pool environment – water, electricity, chemicals, etc. – that when mixed together can be dangerous to the untrained professional. Did you know that all chemicals come with directions? This includes common household cleaning products too! These instructions are called Safety Data Sheets or SDS Sheets. These sheets identify the chemicals, its hazards, first aid measures, handling, storage protocol, and much more. 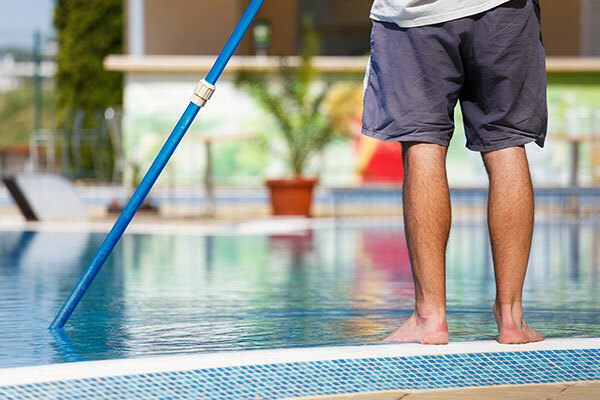 Pool chemicals can be dangerous when mishandled or mixed. Please do not add chemicals to your pool without reading the manufacturer’s directions on the back on the bag, bucket, or bottle, and after reviewing the SDS sheet. It is best to have your pool company handle and add these chemicals as they are professionally trained and certified to do so. Follow instructions as given on chemical containers. Always use a clean and dry scoop. Do not get it wet. Do not share scoops. Always keep chemicals in their original container. Do not reuse containers. Always clean up spills immediately. Follow SDS instructions. NO SMOKING where chemicals are stored. Chemicals should be added only when the pool is clear of people. You’ve heard the old adage: don’t play with fire. Well, don’t play around with electricity ether. Electrical hazards can cause burns, shocks, or electrocution to yourself and can start a fire to your property. Pool equipment needs to be properly bonded and grounded to the pool and should have been done so when the pool was installed. You only want a qualified person who has been trained how to work with and around electricity to touch the electrical components of your pool system. NEVER lean against or touch pump motors. Never spill water on the pump motors. Do not touch electrical switches or electrical equipment, including power cords with wet or damp hands. Wear shoes with rubber soles when around the pool equipment. Close the pool during electrical storms. Never vacuum or touch anything metal during an electrical storm. Read and follow electrical equipment instruction manuals prior to using. Use safety signs, barricades and tags to identify and protect electrical equipment. Never use extension cords around pools/spas. Don’t overload outlets or utilize splitters. Don’t allow dirt, grease or dust to accumulate on electrical equipment. Don’t use temporary wiring in place of permanent wiring. Don’t use cords or equipment that is not properly grounded. Contact a certified electrician when electrical repair is needed. Your pool equipment is comprised of a lot of foreign parts to the untrained individual. Pumps, filters, chemical feeders, and heaters can be scary machines to the homeowner or even a novice! These parts consist of many parts that require maintenance and care. A trained pool professional is educated about all this equipment and more by attending industry certification classes and manufacturer training classes. Do not ever touch any of this equipment without reading the manufacturer’s operations manual and all enclosed and attached safety/warning labels. It is best to just leave this in the hands of your pool professional. 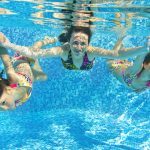 While there are many components at your backyard pool that can be dangerous, when properly maintained by a trained and educated pool professional, you can relax and enjoy the fun that owning a pool brings. Just remember always read directions and use common sense when it comes to safety! If you’re not sure, ask us. We’re the guy for that!